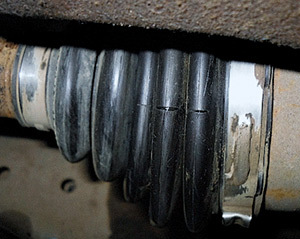 You should check from time to time the condition of the CV joints dust cap in order to avoid the dust cap damage. If you find any defects or cracks in the dust cap it should be replaced to prevent complete failure of the mechanism. I usually happen with old cars due to aging and solidifying of rubber leading to appearing of cracks. In case of disruption of the dust cap it should be replaced. In case the constant velocity joint is not ruined it is recommended to disassemble the mechanism and clean it thoroughly. After that you should apply XADO Grease for constant velocity joints for the whole life span of the vehicle. If failure of the CV joint cup took place long ago and it caused wear of the parts and appearance of cracks, it should be treated with XADO Repairing grease to restore the defects. XADO Grease for constant velocity joints is the most effective product designed to treat constant velocity joints. In order to conduct an essential restoring of the mechanism you should use special XADO greases designed for restoring and repairing units.